Light scattered showers can be expected throughout Thursday, and the heavier pours of rain are forecast to come around 9 p.m. and through the overnight hours. Flood watches are posted for parts of the WTOP listening area. 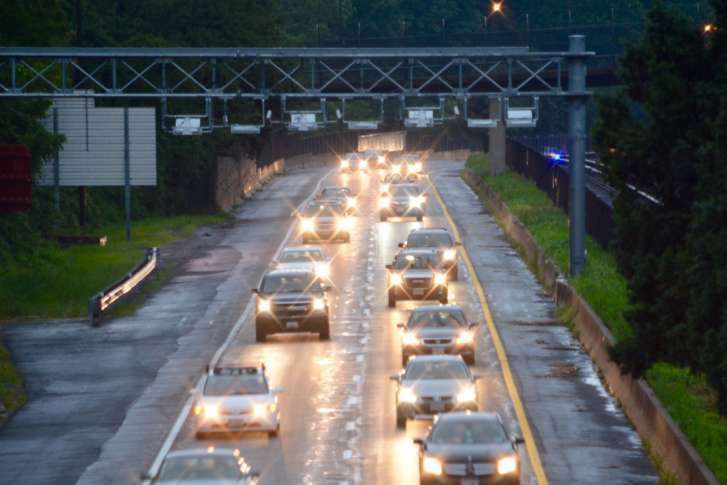 WASHINGTON — More wet weather plagued D.C.-area commuters Thursday evening, a prelude to what will be a rainy night. Around an inch could fall in the region, according to the National Weather Service, and some of it could come courtesy of a thunderstorm. As a result, a flood watch, a flood warning and a coastal flood advisory are in effect, given all the wet weather that has already saturated the area. As if that’s not enough incentive to stay indoors, be advised that temperatures are forecast to drop into the high 50s — a marked contrast to the stagnant humidity that the area was swimming in Wednesday. And while the showers will linger into Friday, take heart: The end of September is scheduled to be chamber-of-commerce perfect, with partly sunny skies, low humidity and balmy temperatures in the 70s this weekend. Light scattered showers will continue throughout Thursday, Storm Team4 Meteorologist Sheena Parveen said, and the heavier rain is forecast to come into the overnight hours. The rain-saturated ground apparently led to a massive tree falling down on Connecticut Avenue near the intersection with Macomb Street in Northwest D.C.
A flood watch is in effect for D.C. and much of Maryland and Virginia through the night for parts of central Maryland and Virginia. Around an inch of rain is possible. Flooding is possible where there is already-saturated ground. A flood warning is in effect through Sunday for the Potomac River at Edwards Ferry. It affects parts of Montgomery County, Maryland, and Loudoun County, Virginia. A coastal flood advisory is in effect until 12 a.m. Friday for D.C.’s shoreline. Flooding is expected along parts of the sea wall adjacent to Ohio Drive and the Hains Point Road and near the Tidal Basin and Jefferson Memorial, according to the weather service. Tidal departure is expected to be 1.5 to 2.25 feet above normal. Thursday will remain cloudy and cool due to a cold front that has moved through the area, Parveen said. An area of low pressure will bring heavy rain later in the evening and into early Friday morning. The rain may stick around for the early part of the Friday morning commute, she said. Thursday: Light rain and drizzle into the evening. Temperatures in the upper 50s and 60s. Thursday night: Rain, heavy at times. Lows in the upper 50s and low 60s. Friday: Morning showers, then gradual clearing. Highs in the low to mid-70s. Saturday: Mostly to partly sunny and less humid. Highs in the mid-70s. Sunday: Mostly to partly sunny and less humid. Highs in the mid-70s.